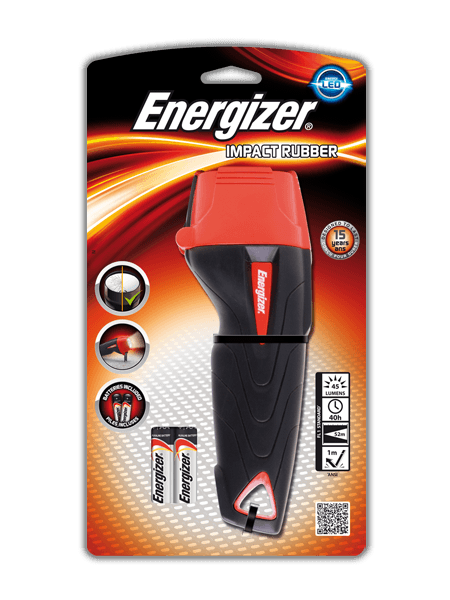 The Energizer® Impact Rubber Flashlight features bright LED technology and a durable ergonomic design. This light offers a non-slip, textured rubber handle for ergonomics and enhanced durability. Designed with a convenient, built-in stand, the light provides hands-free use whenever needed. An integrated lanyard loop makes it easy to attach, while the durable push-button switch is designed to last. The Energizer Rubber Flashlight is the ultimate do-it-yourself light that provides excellent performance and reliability for all types of projects.